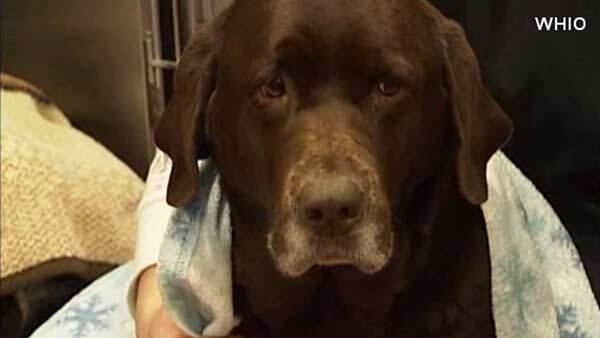 TROY, Ohio -- A black Labrador fell into an ice-cold river in Ohio Monday and somehow fought to stay alive for a half hour. Stella was spotted by workers removing Christmas decorations from a bridge. Firefighters first tried lowering a rope to rescue the 7-year-old dog. When that didn't work, they sent out a specially designed boat. A firefighter pulled Stella in while she was struggling to pull herself out of the water and onto solid ice. The vet that helped save Stella said she was so cold, her temperature didn't even register on a thermometer. "The dog came in chattering, soaking wet. Most people don't even want to be walking around in this cold, let alone swimming in it, so it really tugged on my heartstrings. We immediately assessed the situation of hypothermia," said Dr. Eric Eisenberg, owner, Stoneyridge Veterinary Service. The veterinary staff gave Stella food and fluids and used heating pads to warm her up. They said the Lab's webbed feet and thick coat likely saved her -- adding that a human being would not survive such icy conditions. Stella has been reunited with her owner and is now back home.